A New Coin Collector? In 1965? Back in the mid-1960s, the US Mint experienced a shortage of coins. Plus, a change in the raw metal values, in particular silver, forced a change in the metals used for the coins. You can find links to various newspaper articles about the shortages during that era near the bottom of our mint set pages (1960, 1961, 1962, 1963, 1964, 1965, 1966, 1967, 1968, and 1969). These shortages and the changes in the coins’ metal content piqued the interest of coin collectors back in the day. The news along with the difficulty finding coins also generated an interest in coin collecting for those who had never collected coins. 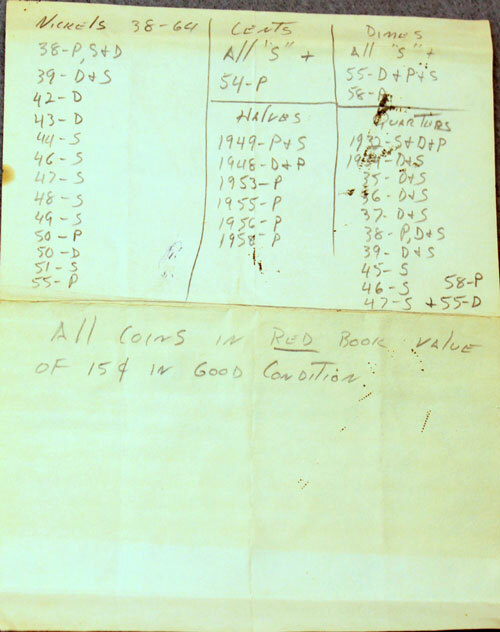 Perhaps these notes, found in a collection, showcase the beginning steps for a new coin collector. This first page shows his notes about pennies, nickels and dimes. 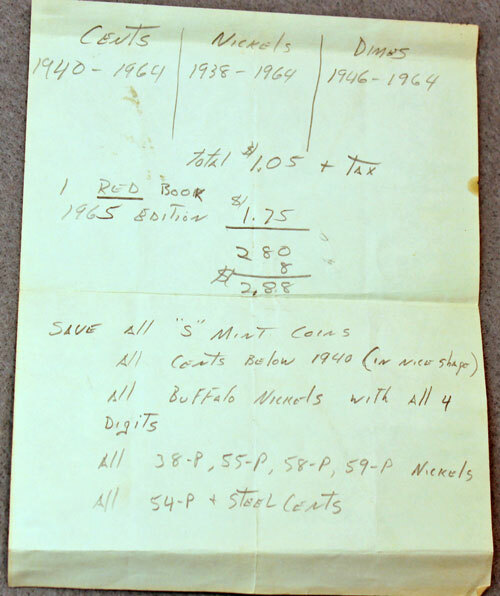 It also shows where he made a purchase of $1.05 in coins and a new 1965 Red Book for a total of $2.80 plus tax. The tax shows $0.08 for a total purchase of $2.88 which was not insignificant back then. As an aside, those totals represent a nice trip down memory lane regarding sales taxes. For those who don’t know or don’t remember, we used to have sales tax of three cents on the dollar. His next page goes on to detail specific years and mint marks by denomination. Is this what he wants to look for in pocket change in “good condition?” Though difficult today, back then you could still find coins with those dates in pocket change. And, had he found several of the coins listed, he could have enjoyed a significant increase in the value of his collection. For example, the 1932 D and S, 1936D and 1937S quarters, the 1939D and 1950D nickels and the 1949S and 1950S dimes are some of the key dates in the years he noted. Did this gentleman pursue his interests? Or, did these notes get put aside to be visited on rare occasions? Maybe he bought a few of the US Mint collectible sets, either mint sets or proof sets. In all likelihood, that’s where he hid his notes for us to find many years later. For some people, those coin shortages in the mid-sixties started their lifelong and intense interest in numismatics. For others, their coin collecting days were few and far between – maybe when they received their annual mailings from the US Mint. Whether an intense hobbyist or a casual one, we hope this gentleman enjoyed his coin collecting and coin collection during the last 45+ years.